Literary Aside: Tolkien, Lewis, Rowling, and Rand? Tolkien vs. Lewis: Does religion matter? Sometimes you find odd questions in polls that allow you to explore things you never imagined. One of my favorite sources for these are the 60 Minutes/Vanity Fair polls conducted with CBS News. The involvement of 60 Minutes guarantees religion will be among the demographics (allowing for a comparison of Catholics to others). The involvement of Vanity Fair means you get questions that are often unexpected and abstract. A recent example allows for the examination of something at the crossroads of religion and literature. Two of the most popular book series in history sprung from Catholic author J. R. R. Tolkien and Anglican author C. S. Lewis while both were at Oxford. This literary friendship (and rivalry) later spilled over to the Christian masses. With recent film adaptations of their work, most Americans presumably now have awareness of their stories. One might assume that Catholics might prefer Tolkien’s tales of Middle Earth to Lewis’s stories of Narnia. Perhaps Protestants might exhibit the opposite? That is a testable hypothesis (maybe not an important one... but one of my areas of study is popular culture so I am interested). A recent 60 Minutes/Vanity Fair poll provides the data for that test (Nov.-Dec. 2010, N=1,067, margin of error ±3 percentage points). 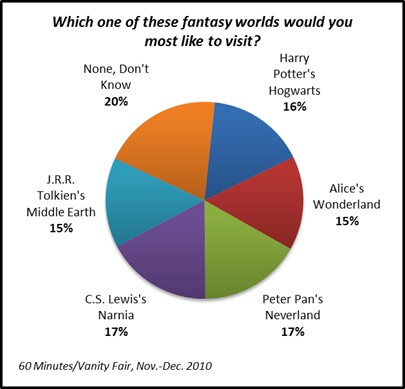 Respondents were asked, “Which one of these fantasy worlds would you most like to visit—Harry Potter’s Hogwarts, Alice’s Wonderland, Peter Pan’s Neverland, C.S. Lewis’s Narnia, or J.R.R. Tolkien’s Middle Earth?” Oddly, Americans are almost evenly divided on which mythical realm they’d like to vacation in. Narnia and Neverland split the lead but all of the percentages are similar given margin of error. One in five either could not decide or did not wish to visit any of the worlds. Looking at preferences by age reveals a bit more. Among the under-30 crowd, Hogwarts is a clear favorite. This is the generation that read and saw J.K . Rowling’s story evolve from the first book in 1997 to the last film in 2011 (the oldest members of this cohort were 17 when the first book was published). Their second preferred destination is Tolkien’s Middle Earth—which also was a box office favorite in the last decade. 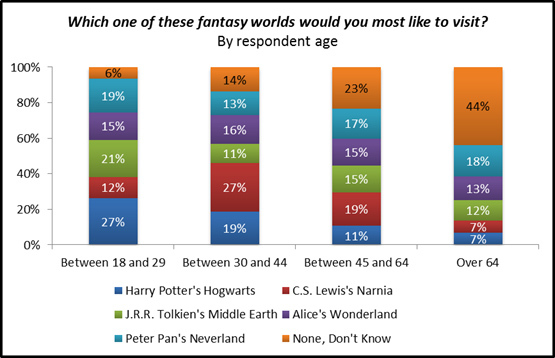 My own generation, those 30 to 44, which grew up reading about Narnia—most often in The Lion the Witch and the Wardrobe—prefers Lewis’s fantasy world over the others, followed by Hogwarts. It seems that the magic disappears a bit among Americans age 45 and older. Their leading preference is one of indecision or “none.” People really do seem to grow up (but apparently not until 45 and I’m not there yet). What about the impact of religion? Catholics are as evenly divided as the population overall. If we take the survey percentages literally (ignoring margin of error), the Catholic respondents were more likely to select Alice’s Wonderland than any other option. Seems a bit of a surprise. Narnia trails Middle Earth by 4 percentage points (12% compared to 16%). In a clear lead among Evangelical Protestants is a preference to visit Narnia at 28% (followed by none or don’t know). Mainline Protestants are about as evenly divided as Catholics. A desire to visit Hogwarts has an overwhelming lead at 31% among those with “other” religious affiliations. Nones (i.e. those without a religious affiliation) show a preference for Tolkien’s Middle Earth. 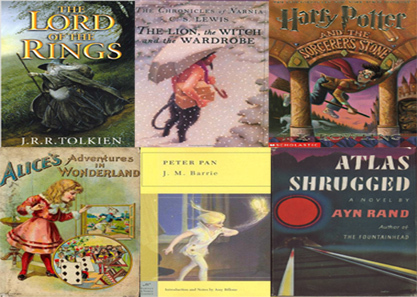 All of these literary works have film adaptations (… and the most glaring omission from the survey question is Dorothy’s Oz. … Perhaps the question was written by an Anglophile?). At the U.S. box office Tolkien’s Middle Earth wins out. 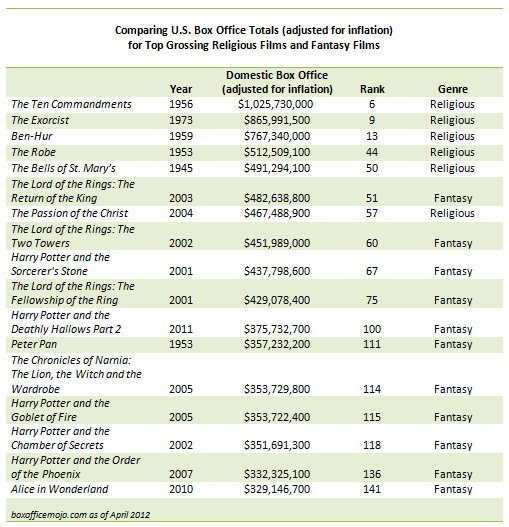 After adjusting for inflation it is the only literary fantasy film to rank higher at the box office than America’s leading religious films (in terms of revenue, not necessarily in artistic or theological value)—just edging out The Passion of the Christ. It appears there is not much that differentiates Tolkien from Lewis in American minds or film choices (reliable data for all-time book sales does not exist). Narnia edges Middle Earth as a fantasy destination, whereas Middle Earth draws more to the movies (but this may be due more to the quality of the films than the essence of the stories themselves). The real interesting dynamic is with J.K. Rowling’s Hogwarts. If we were looking at the global box office rather than the American, there would be little competition to any of the others. What is it about Hogwarts that makes it less appreciated in the U.S.? Take a look at the Evangelical Protestant percentage in the survey question—just 8% say they would like to visit here. Take a look online and you will find what seems like an unending series of posts and articles written by Evangelicals about the “pagan” dangers of the Potter series (there are also a few Catholics in the mix). Although wizards and witches are a staple of the fantasy genre it appears these are only acceptable to some Christians when they come from the pen of a notable Christian author. Rowling self-identifies as Christian but this is not at the center of her work or public persona in the same way it was for Lewis and Tolkien. One other odd thing you’ll find in the box office data globally is the lackluster success for The Passion of the Christ. Its strong following was almost a uniquely American phenomenon. Where it succeeded Harry Potter suffered. As shown in the table above Americans have historically come out well for religious films (...yes The Exorcist is a religious film. Although the USCCB movie review notes “the movie is on shaky ground theologically” I am at Georgetown. How could I leave it off the list?). But most of these religious films were made decades ago, whereas fantasy movies fill seats these days. Only The Passion of the Christ is an outlier. But it is an important outlier because it does show that that desire to see faith on screen still exists in the American psyche. I imagine if Hollywood made a greater effort to develop religious films and scale back a bit on super hero series they might find themselves surprised by some of the domestic profits they could earn. As for Rowling, and any others creating a fantasy series (books and/or films) with wizards and witches, I guess there is a lesson in the data as well. If you want to succeed in America it is important to wear your religion on your sleeve. I am not sure how I would answer the Vanity Fair survey question myself. My preference wasn’t listed. I’d choose the Doctor’s TARDIS (...I know it’s not literary and it’s sci-fi rather than fantasy, but hey bow ties and scarves are cool). I am a nerd (...who else would write a post like this?). Once upon a time (this morning actually) Rep. Paul Ryan, architect of the Republican Party budget, came to Georgetown. A good number of Georgetown faculty are using this occasion to let him know that they are disappointed with his budget. I could not sign the letter as I always try to be a detached and objective observer (unregistered to vote, politically inactive). I also would like to see more of these letters from faculty, whether here at Georgetown or other Catholic colleges and universities, when figures on the Left who gravely ignore the Church’s teachings appear on campus (although to be fair, I would be unable to sign on to these as well… I probably should not be giving advice on this topic!). Ryan has noted that Rand was a key figure in his intellectual and professional development saying, “The reason I got involved in public service, by and large, if I had to credit one thinker, one person, it would be Ayn Rand” (...he reportedly asks his staff to read her epic, Atlas Shrugged). This quote may have gone over well in a room full of Objectivists but it might not ring as well in a room full of Catholic bishops (or Georgetown faculty). Rand’s libertarian philosophy is often in direct opposition to the values, teachings, and culture of Catholicism. Alas, this post has its own final twist (...before I am accused of losing my detached, non-partisan objectivity). Rep. Ryan does deserve credit for offering and voting with his party on a budget plan. Although I think it provides unsatisfactory outcomes, it is a start to a process that could fix the dilemmas we face as a country (doing nothing is not an option). I don't know how Democrats in Congress are seriously vying for votes in 2012 without putting their own budget plan on the table. Maybe they are just looking for a good writer? Fantasy authors need not apply. Update (4/27): Rep. Ryan has now disavowed his statements regarding Ayn Rand because of his view that she promoted an “atheist philosophy.” But that may not be the best reason for a break up. Catholics are in no way prohibited from reading or learning from the works of atheists. Catholics can even marry an atheist in the Church in a non-sacramental ceremony (it’s by no means encouraged or advised but it is permitted with a dispensation from your bishop). Even popes take advice from atheists on occasion (and I assume they give spiritual advice back to these atheists as well). Not believing in God does not make one universally ignorant. If I wanted to understand black holes I would do well to read Stephen Hawking. When I read what he has to say about religion I feel bad for him on this point but this does not falsify his knowledge of black holes. Ayn Rand is not offensive because she did not believe in God. That was her problem (just as it is Hawking’s). She is offensive because she created a political and economic philosophy that is in conflict with the Church’s commitment to a preferential option for the poor (she discouraged public assistance and private charity... in her words, “What I am fighting is the idea that charity is a moral duty and a primary virtue”). Most reasonable people understand that if everyone acts as selfish as possible the world is not likely to achieve her utopia. Marx was guilty of a similar ignorance thinking this could be achieved by enforcing universal equality. There is a happy (real world) middle ground between these two atheists that can provide for individual liberty and property, a viable social safety net that protects people in times of need, and belief in God. In a recent post we presented research indicating that President Obama could win re-election without winning a majority of the Catholic vote (which is historically rare and difficult to do). This is possible with the rising number of U.S. voters without a religious affiliation (i.e., Nones) who historically vote overwhelmingly for Democrats in presidential and congressional elections. We indicated that the president could go no lower than 44% support among Catholics and Protestants if he hopes to win re-election. With the Republican nominee decided (in all likelihood), the first national head to head polls are coming out. Gallup surveys have shown President Obama trailing but this gap is within the margin of error. Today, Pew released results that also show a tight race with a slim lead for President Obama. It is still a long, long time before any of these polls are predictive of anything. But as a first look, the Obama campaign might be second guessing some of their recent decisions that may have alienated religious voters. The Pew survey of 2,373 registered voters (landline and cell phone samples) was conducted April 4-15 (margin of error +/-2.3 percentage points). Among Catholics overall, Gov. Romney leads Obama 50% to 45% (he has gained 8 percentage points on Obama since March). This level of support is also consistent with what President Obama would need to make the electoral math work for him (although by just 1 percentage point). His bigger problem is among Protestants overall where his support dips to 43% (and even much lower among Evangelicals). This is too low to indicate a good chance for re-election. More problematic for his campaign is that his support among Nones has dipped below the 70% he needs to comfortably counter-balance poor support among Christian voters (67% now compared to 75% last month). The survey results also indicate that this is likely due to the respondents' overall concern about the economy rather than social issues, where Democratic Party policies attract the votes of Nones best. Social issues lag far behind the economy, jobs, health care, and the deficit in stated importance. Pew and other survey research organizations frequently report specifically on the preferences of "White Non-Hispanic Catholics." Regrettably, in this survey they don't give us the numbers for Hispanic/Latino(a) Catholic registered voters. But there may be good reason. There are likely too few of these respondents in the survey for them to comfortably report the information (i.e., margins of error are too high). However, this does not make this group unimportant! 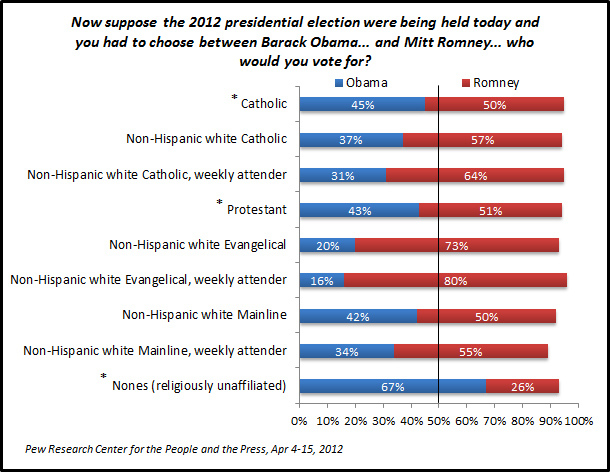 In fact compare the percentage support for either candidate among Non-Hispanic white Catholics and Catholics overall in the chart above. Hispanic/Latino(a) Catholics' support for the president is primarily what is keeping his current overall support among Catholics above 44% (...it is also notable that support for the president among Catholic women is measured at 51%). Hispanic/Latino(a) Catholics are the fastest growing part of the Church and the Catholic electorate. Their growing influence is in some ways as important as the emergent None voters nationally (and even more important in specific states accounting for the Electoral College). For more research on the Catholic Hispanic/Latino(a) voter see the upcoming release: Blessing La Política: The Latino Religious Experience and Political Engagement in the United States. As the publisher notes this book is "an essential guide to the new face of electoral politics in America" providing a "comprehensive analysis of the political tendencies of Latinos and Latinas of faith." How do I know? I wrote the epilogue, "The Growing Influence of the Latino Catholic Vote." Look for more on this topic on this blog soon. Anne Hendershott and Christopher White have a piece in The Wall Street Journal today, citing CARA, which notes the number of new ordinations to the priesthood in the United States and that some seminaries are at capacity and have had to turn away applicants. All good news. However, the Catholic Church in the United States still faces significant challenges when it comes to vocations. As we have discussed here previously there is no shortage of Catholic men who say they consider the priesthood. Yet there still are too few who decide to follow through and become priests. The WSJ piece notes there were 467 ordinations last year. These data are listed each year in The Official Catholic Directory (OCD) for the United States and worldwide in the Annuarium Statisticum Ecclesiae (ASE). The 2011 OCD lists 467 ordinations in the U.S. (as well as 13 others in U.S. territories), yet these ordinations occurred in the year previous, 2010. These include both diocesan and religious ordinations. There are no official numbers out yet for 2011, but CARA estimates these to be very similar to 2010 (possibly exceeding 480). The ASE provides detailed information for every country on the annual changes in the numbers of diocesan priests (those most likely to be in parish ministry). Of the 467 ordinations in 2010, 402 were diocesan. That is a bit above the average of 391 diocesan ordinations during the 1999 to 2009 period but not by much. As shown below, one of the most stable trends in U.S. Church data since the mid-1980s has been the annual numbers of diocesan ordinations. Despite this rather predictable inflow each year, it is still not enough. The number of diocesan priests dying or departing the priesthood annually is larger than the number of new priests ordained. What results is a net loss in the numbers of diocesan priests. In 2010, this resulted in a net change of -301. These losses accumulate each year creating a running deficit in the number of diocesan priests (for more see my piece on this topic in Our Sunday Visitor). These losses are dealt with, in part, by bringing in international priests who have been ordained outside the United States. When too few priests have been available, bishops have also utilized Canon 517.2 to entrust the pastoral care of parishes to permanent deacons or lay persons, clustered parishes, or merged and closed parishes. What can we expect for the future? As the WSJ piece notes, there are seminaries in the United States that are at capacity and new seminaries are being built. But this is related more to realignment than a groundswell of new seminarians. Seminaries have closed and others have reduced their capacities. Since the mid-1990s the number of seminarians has remained about as stable as the number of new ordinations. There is not much change here either—which is also good news. There have been few, if any, indications of declines in priestly vocations for two decades. Yet the challenge remains because the Church doesn’t just need stability it needs growth to keep up with a growing Catholic population and an aging clergy. In many ways the Catholic Church is coming to terms with an important period of its history (for more see: Same Call, Different Men: The Evolution of the Priesthood since Vatican II). The number of ordinations in the mid-20th century was extraordinary. Many of the surviving priests ordained in that period are now in their 70s or even older. Replacing them all is a big challenge. It cannot be done with less than 500 diocesan ordinations per year. In fact, the Church needs more like 700 per year to establish stability in the numbers of U.S. diocesan priests overall. 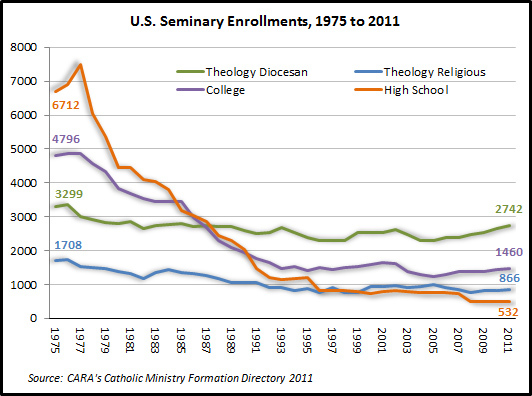 The WSJ piece indicated that “renewal is coming.” Take a look at the green line in the chart for the seminarians above. This represents those enrolled at the post-baccalaureate level of priestly formation for dioceses. This line has been on an upward slope since 2005. The totals are growing by about 20 individuals per year. That is something to cheer (and study more). At the same time Catholics should not go away from reading the WSJ piece thinking “great, problem solved!” Significant challenges remain to close the deficit that we have accumulated. 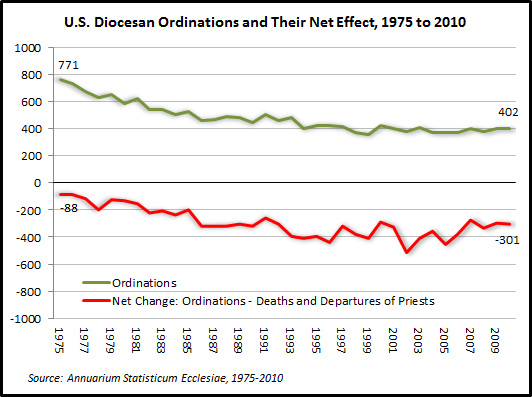 Getting 700 ordinations per year would simply level off the current downward slope in the number of diocesan priests. Turning U.S. trends positive will require significantly more.